Food really matters – and with two out of three cancers being related to food choices there is a wake-up call for all of us to start reading labels and stop putting faith into the system. Many items are approved by government agencies, yet whether these items act alone or synergistically with other chemical additives in foods, something is seriously wrong. If everything on the market is totally safe for human consumption, why are 2 out 3 cancers food-related? In addition, why is it that we (especially in Canada and the U.S.) have a pandemic of poor nutrition? Every day, far too many people are either under-the-weather, fatigued, are ill, or have serious health issues. Obesity is a serious problem. If all the food additives and preservatives are legal to use then why are so many people always ill? We have a serious problem – nutritionally-depleted foods are sold on grocery store shelves, foods that are irradiated, and foods full of chemical additives and preservatives; simply stated, we are not getting the food nutrition our bodies need. And if we are getting nutrient-rich produce some of that goodness is offset with the pesticides used while being grown – or it may be genetically modified. Eating nutrient-rich produce grown with chemical pesticides puts our body into a serious battle for wellness or for illness. For those who are barely winning the battle for wellness, if they have lifestyle choices that include smoking or drinking alcohol, then they are furthering the cause for illness. There are really no surprises why so many people suffer from countless ailments. Food – rather the lack of food nutrition is the root cause of far too many health ailments according to many professionals. Never before has it become so crucial to learn how to win this battle for wellness. Adding wild edibles to your daily meals will certainly help boost your body’s battle for wellness. Even if consumed as a tea, wild edibles not only provide nutrients, many are immune boosters. FOODMATTERS® is a hard hitting, fast paced look at our current state of health. Despite the billions of dollars of funding and research into new so-called cures we continue to suffer from a raft of chronic ills and every day maladies. An admission fee of $2.50 is required to help offset the cost of the venue rental. Copies of Free Food from Foraging will be available for $4. Free Food from Foraging is an information–packed 20-page book that addresses soil nutrients, pesticide use, buyer-beware when it comes to vitamins (some contain aspartame), food miles, foraging and so much more. 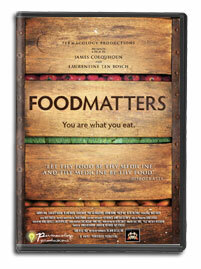 If you are unable to join us for this screening, be sure to go to FOODMATTERS® and purchase your copy. If you have any questions, please email Karen at [email protected]. You’re so amazng. I love your style of writing cause you sure get your facts right. Food does make a huge difference with how we feel. Keep up the amazing work you do I love it!